Free Video Violin Lesson 4 | Free Violin Lessons at Stringsavvy.com! 1. What is a scale? 2. What does pizz. mean? 3. Can you place your finger on and name each note on the D string? 4. Are you playing all of your notes with the correct finger, or are you getting lazy and moving your fingers around? Pay attention to where you fingers go! 5. What does does a bracket underneath notes mean? Hello and welcome to Stringsavvy.com Violin Lesson #4! In the last lesson we went over our finger numbers, the notes on the D string, as well as the bow hold. Today we will be learning the notes on the A string, the D major scale, and begin to learn how to use the bow. If you remember from last time, our finger numbers work just like counting. Index is 1st, Middle is 2nd, ring is 3rd, pinky is 4th. We won’t be using the 4th finger just yet, but will come soon. Just like we found 3rd finger G on the D string, we are first going to place our thumb on the neck right over our first finger marking. Our thumb serves as a home base to remember where our first finger goes. If the thumb is too high or too low, chances are your finger will follow. Place your 3rd finger on the 3rd tape on the A string, and now we are ready to play 3rd finger D! Make sure you are plucking and placing your 3rd finger on the A string, and not the D. This can be a little confusing because the note we are playing is also called D. However, if you look at the staff you will notice that our open D string is at the bottom of the staff, while the 3rd finger D on the A string we are about to play is on the 4th line. Remember Elvis’ Guitar Broke Down Friday? Getting into position for C#, is just like how we did F# on the D string. Place your 2nd finger directly behind your 3rd finger. Remember – This should be nice and tight with little or no room between your fingers. Keeping your 2nd finger down, lift of your 3rd finger. Now you are ready for C#! If you take a look you will notice that Take Off is almost exactly like Lift off. The only difference once again is that it is played on the A string. Be sure to keep your 2nd finger down the entire time. Whenever you play a D, put your 3rd finger down, whenever you play C#, raise your 3rd finger just barely over the string. Remember to keep your 2nd and 3rd fingers CLOSE! Now on Caribbean Island we will be playing BOTH the 3rd finger D and the open D. Remember what I showed you before about the difference between the two! If you look in the 2nd and 4th measures you will notice there is a bracket around the groupings of 3rd finger and open Ds. Do you remember what a bracket tells you to do? If not, review the previous lesson for a quick reminder! So you may be wondering now, why do we have TWO Ds? The reason is that in the most common groupings we only have seven notes, “A B C D E F G.” What comes after G isn’t H, but rather another A. These seven notes repeat themselves, and whenever you travel from one note and go up 8 to itself again, you have what is called an octave. Example in #32 that we will soon be playing, the notes pan out by measure, D E F G A B C D. So the distance between the two Ds is an octave. If I were to play those two Ds separately and together, you would hear that they sound very similar. In fact when played together- it only sounds like one note being played. If I were to play a D and a C# together you will notice a very big difference in the sound. This is because D and C# are NOT the same notes. 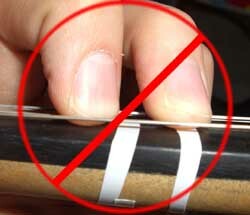 B is played on the first finger marking with your first finger, just like E on the D string. Alright, now we have learned all the notes on our D and A strings, lets move on to #31. Which D does it begin on, open D or a 3rd finger? That’s right, its 3rd finger on the A string! You will notice the book helps you by writing in finger numbers, try not to cheat too much while you are learning. The sooner you learn your notes and fingers the better off you are. Some of the song we will be working with next week will have eliminated the note names, and they will be gone forever! Do you know your note names? Are you watching the music or staring at your fingers? it was so surprising for me when i read your reply, how could u understand my nationality? bale man irani hastam, shoma khub farsi sohbat mikonid va in baram kheili ajibe. mishe fozuli konam beporsam dalilesh chie? i just wanted to ask if it is a must that we practice every lesson in each seperate week. Though they are designed to work at your own pace, through my experience it is best for you to take your time. I have taught many students who will fly through the beginning parts of violin- getting how to do it- but not fully understanding it. Suddenly the day comes where they hit a brick wall and we have to go back and re-learn the things they flew through earlier. Master each lesson then move on at your pace! thanks loads for the quick reply last time round. really helped. think i’m slowly getting a hold of . sorry for interrupting again… now i’m kinda having a bit of problem with the bow hold and the fingers exercises. my fingers feel relaxed enough when i try ou the bow hold normally and i think i can kind of do the thumb flex and pinky tap reasonably well. but the trouble starts whenever i try to pull off tapping my index finger. the weight of the whole bow seems to totally come down and i have trouble holding on to my bow after lifting it up. as a result, my thumb and pinky tends to get quite tense and taut while executing it. am trying my best to adjust my finger positions a bit but can’t really solve the problem completely. after about 5-10 minutes of practice my thumb especially can feel a bit of a strain. is this normal and it’s just a matter of time until my fingers start to gain strength? or maybe i’m holding my bow wrongly? where (which fingers) should the weight of the bow lie when holding it? Yes, don’t practice that so long where your fingers are feeling strained. My recommendations is if you need the help, go ahead and rest your left index finger under the tip of the bow to help carry the weight of the bow. I’d like to thank you for sharing to us your skill. Though I’m starting off late (22yo), I believe that determination and discipline can offset the age factor. I’m now on the 4th free instructional video and I’m practicing along with it. I’m just wondering where I could find the reference book for the videos. Can it be found on this website as well coz I can’t seem to find it. Anyhow, happy New Year and all the best! Hello Elliot! I am so happy to hear you’re getting value from these lessons! Thanks for the swift reply. Your lessons are invaluable! i’ll use these lessons to become a great musician! by the way,anyone here from Philippines? I have just discovered your lessons and enjoying my first lessons ever on violin. I am 56 years old and recently got interested in learning to play violin. I have no experience of reading music or playing any musical instrument in my life. I rented a student violin and started with your lessons last week. My question is as follows: After practicing the bowing and fingerboarding from your lessons following the books pages 6-11 (I am doing both plucking and bowing) my fingers in both hands get numbed, not immediately but at night during sleeping. Is this a common problem or is it something that I am not doing right or perhaps I am too old to do this. I appreciate you answer. Thanks very much. Hello Carl, when you say your fingers are numbed… are you referring to the pads of your fingers reacting to a new friction causing some tingling? Or are you feeling an overall numbness in both hands? One recommendation would be to ensure your hands are relaxed. New students may sometimes have a lot of tension in their hands when learning, which could cause discomfort later in the day. If problems persist it might be beneficial to speak to a physician.